My friend Scott has a front porch with a nice-sized overhang that allowed him to put his audio-visual equipment outdoors. 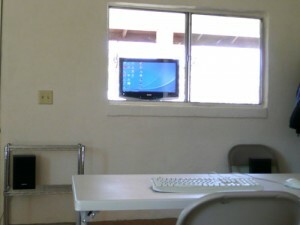 He views the computer through the window (see photo, above left) and it’s far enough away (about 12 feet) so that he is not affected by the electromagnetic fields. He says that, chemically, it’s perfect because the monitor sits outside his window and the fumes from plastics and heated electronics do not enter his house. 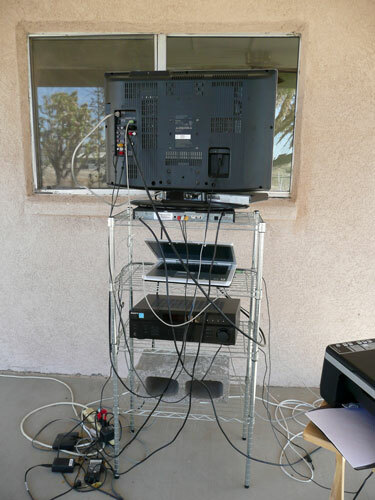 You could use this same setup for a TV and DVD player, providing you have decent weather and a deep enough overhang to protect the electronics from rain, snow, and dust. My neighbors Marjorie and Jim had a “TV box” built into their new home. 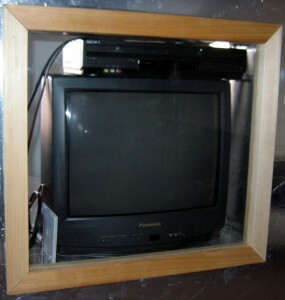 The TV sits behind glass so when watching the monitor, no fumes enter the space and again, they can sit as far back as necessary to avoid any uncomfortable EMF exposure. 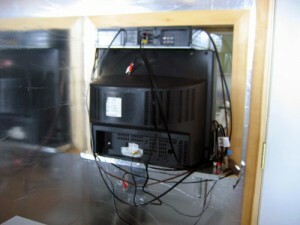 One downside to their setup is that the back of the TV is exposed to the entrance when you first walk into their home. Another neighbor has a similar setup but the TV room is isolated from the rest of the house so she does not get exposed to the fumes when entering her home. I have heard of others who have TV boxes built so the back is accessible from the outdoors. Another neighbor shared this photo of his computer box – a vented metal box with a sliding safety glass front (not shown in photo) made by the late Fred Nelson of the Safe Reading and Computer Box Company. It’s made of 20 gauge galvanized steel and measures 24” x 24” x 24”. The vent fan is located at center back and a portion of the aluminum exhaust tube can be seen in the photo. This computer box could easily be used as a TV box if you have a monitor that fits the space. As far as I know, these are no longer being produced but you might find a used one for sale on occasion in the Chemical Injury Information Network’s newsletter Our Toxic Times, on eBay, or posted on one of the online MCS discussion groups. Kathy and Gary have a unique setup. 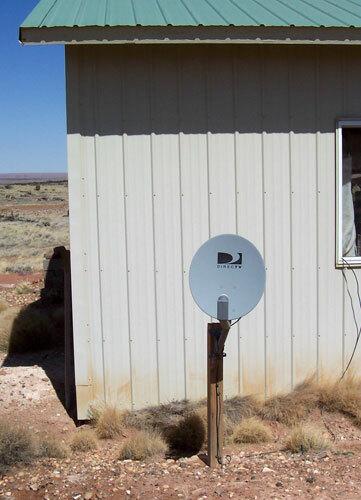 Their primary intention was to eliminate EMFs so they put a satellite dish and receiver about 200 feet from the house. 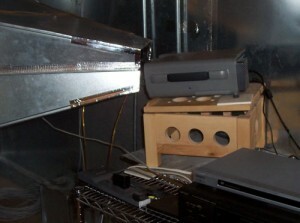 In the barn, the receiver sits on a DVD recorder. They also have a TV monitor there so that they can see what they are recording, and so that they can program the DVD player to record, erase disks, etc. They are able to tolerate the EMFs standing in front of that TV for short periods and using the remote controls. After recording their favorite TV shows when they air, they bring the recorded DVDs up to the house and put them in a DVD player in the projector room (behind their TV screen). 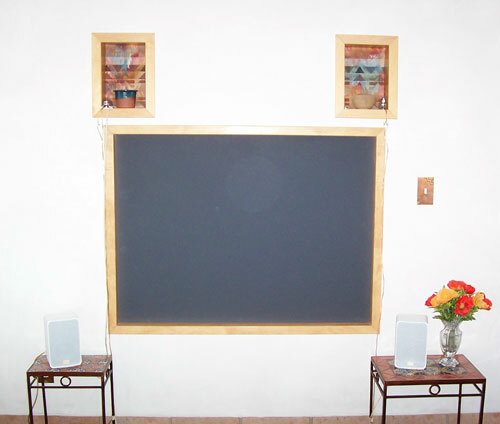 The DVD player is attached to the rear projector, which projects the images onto the screen on the living room wall from behind. The DVD player is also attached to a stereo receiver which is cabled through the living room wall to the speakers there. There is also a transmitter for the remote control for the DVD player. When they are in the living room, they can control sound level, fast forward, etc., using the remote control. There is also a unit in the living room wall above the screen that transmits the remote control signal into the projector room so the DVD player can sense and receive the signals. 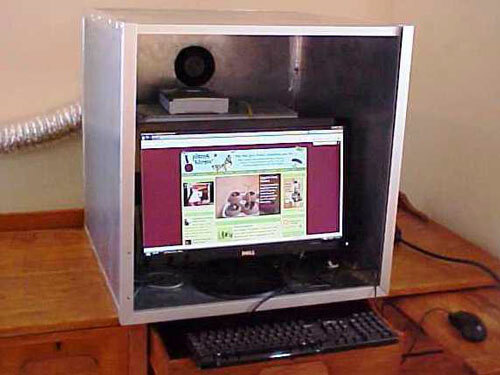 They use a Sharp DLP projector and warned that not all projectors would end up being bright enough, or be able to focus in the relatively short distance between the projector and screen (seven feet) so if you want to try to replicate this setup, be aware that finding the right projector can be a hit or miss project. These are great ideas! We are having computer reactions big time over here. As Julie said, it’s really best to have the computer on a covered porch to protect it from sun, rain, etc. 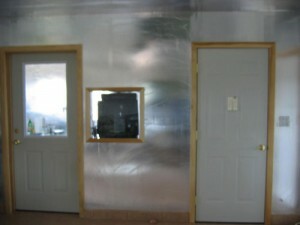 If you don’t have one then you could build a small ramada to just cover the computer for not a lot of money. Feel free to email me directly at scottkillingsworth@yahoo.com if you have any questions about my setup. I like it because it’s simple, cheap, portable, and has enabled me to stay connected to the world for the past 5 years in a way that I otherwise wouldn’t have been able to do. Thanks, Julie and Scott! Great article! Also, I noted that you seem to not be aware of the fact that remote controls are an EMF danger. Thanks so much for the link Harry, of course that is okay! Glad you enjoyed the article. I think it is so helpful for people to see a range of solutions (and photos!) for these types of issues with managing daily MCS living. I hope to continue to do more of these kind and it’s great to get positive feedback. Thanks for stopping by! Until the late 1990’s, I did not have any MCS reaction issues with computers (I have been chemically sensitive since at least the mid 1980’s). But computers from late 90’s forward generally seem to reek (both when they were new, and also even now after many years of use). I have mostly stuck to older computers, but this is becoming increasing problematical as they become more and more obsolete. Has anyone had any luck with any particular later model computers (Pentium P4 or higher) that they could possibly recommend? Would welcome any updated info on laptoop computer box ….for mcs person. I met a computer salesman at Staples one day who claims to have emf sensitivity. He recommended a laptop and a remote solar keyboard. If it needs to be a long distance then run it through the tv monitor. Has anyone used a remote solar keyboard? I am talking with George at TEchnology Alter. Corporation about having him outgass a netbook for me and wondering if anyone has had any experience, favorable or not, with his work? I’m recovering from MCS/ES and have one of Fred Nelson’s computer boxes for sale. See my craiglist ad in Western Mass under General or Computer. Fred was an amazing guy, his care and expertise helped me a lot! 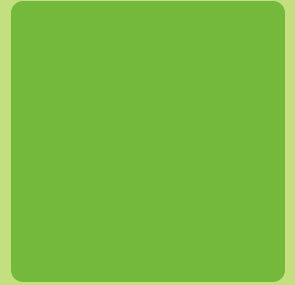 I discovered that besides EMFs and offgassing from computers, a major bugaboo for me was the flourescent lighting in most computer screens. I now use an iMac which has revolutionized my computer use. I don’t need a box for it because after an initial offgassing it doesn’t emit any troublesome fumes, it uses LED light in the screen, the casing is all metal and glass, and the processors are balanced in some way internally so the EMF they emit isn’t disruptive. That’s wonderful, Ziporah, and thanks for posting about your ad for the computer box. What model/year iMac do you have? I have a MacBook myself that I have always done well with. Would love to know what you are using. Thanks for posting! I’m sensitive to all computers if they are not connected on a network. I don’t know what the name of my disorder might be. It has nothing to do with off-gassing or fumes, but rather with something electrical or EMF or something like that – the internal workings of the computer. I’m fine if the computer is connected to a network of other computers, but when its the only computer around, I get severe problems. Anyone have any ideas on that?